If you have bought a new HTC One, HTC One X or HTC Mini, you will agree with me that BlinkFeed is utterly irritating. 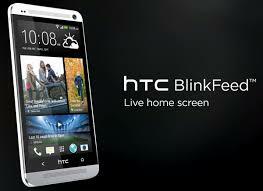 You new HTC One is one of the best Android smart phones that there is with incredible display, powerful processor and stylish design but for the HTC Sense's BlinkFeed. The BlinkFeed by default becomes your homescreen whether you like it or not. So, there are many of us who would like to remove this home screen without rooting the phone. This article is for people who would just like to hide the BlinkFeed and have something they prefer as home screen. There is a option of hiding your BlinkFeed through the settings in HTC devices but if you would prefer to have your own custom homescreen the best option is to is to download and install a nice professional looking App launcher from the Google Play market. For the uninitiated, an App launcher replaces your homescreens and app drawers, and can drastically alter the way your phone feels and operates. Remember that installing any of these homescreen App launchers and pressing the 'home' button, you'll be prompted by Android to select which one you'd like to use as your default. If you fancy having a play around before deciding once and for all, simply select the launcher and then tap 'Just once'. When you're sure you like the one you've picked, select 'Always' and it will be set as your default launcher. I have list my favourite App launchers below, so that you can take your pick as per your choice. All the five are free version and some may have paid or pro versions available but it always a safe bet to try it out first. -Lots of settings to play with: texts, colours, animations, sizes.. the more you dig in the more you will enjoy the colours and texts. Download the ADW.Laucher from Google Play here. You can download the free version of Go Launcher EX from Google Play here. The fact that it has been updated just today makes it even more worthy of download so head over to Google Play here. As I have said earlier, this Launcher hasn't the sleekest of feels but it does its job alright. To download it, visit Google Play here. •Incredible 3D Experience : Your mobile device home is equipped with the most innovative 3D effects. Just imagine rotating ceilings, walls, and floors. Each room of your home will seem to come to life! •Numerous Customization Options : The 3D Home offers 5 customization options: 3D objects, applications, shortcuts, widgets, and wallpaper. Choose 1, 2, 3, or more options and build a home only you could love! •Innovative Menu Interface : Access your apps with a single press of a button! •Scrollable Dock : Quick and easily switch between your desktop and the top and bottom of the screen! •Quick Access to Common Tasks : Your most common activities on your mobile device (phone, contacts, messaging, apps console, and Google Play Store) are accessible from a single location on the home screen. •App Sorting Selections : Arrange your apps for easy access. Choose to sort by name, recently installed, or frequently used. To make your HTC One feel just like a home, download the 3D Home from Google Play here. Remember this launchers can be used on any of the Android devices you may own and wish to customise. If you are interested in any other launchers click here.